During the last few years, mobile broadband access has been a popular concept in the context of fourth generation (4G) cellular systems. After the wide acceptance and deployment of the wired broadband connections, such as DSL, the research community in conjunction with the industry have tried to develop and deploy viable mobile architectures for broadband connectivity. The dominant architectures which have already been proposed are Wi-Fi, universal mobile telecommunications system (UMTS), WiMax, and flash-orthogonal frequency division modulation (OFDM). In this chapter, we analyze these protocols with respect to their security mechanisms. First, a detailed description of the authentication, confidentiality, and integrity mechanisms is provided in order to highlight the major security gaps and threats. Subsequently, each threat is evaluated based on three factors: likelihood, impact, and risk. The technologies are then compared taking their security evaluation into account. Flash-OFDM is not included in this comparison since its security specifications have not been released in public. Finally, future trends of mobile broadband access, such as the evolution of WiMax, mobile broadband wireless access (MBWA), and 4G are discussed. Authentication: Verification of the identity of a user or network node who claims to be legitimate. 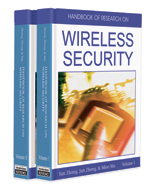 WiMAX: Wireless metropolitan area networking based on IEEE 802.16 standards. Broadband: A network connection with a bandwidth of about 2 Mbps or higher. EAP: Extensible authentication protocol (EAP) is an authentication protocol used with 802.1X to pass authentication information messages between a suppliant and an authentication server. UMTS: Universal mobile telecommunication system (UMTS) is a global third generation wireless cellular network for mobile telephony and data communication with a bandwidth up to 2 Mbps which can be upgraded up to 20 Mbps with high speed packet access (HSPA). Integrity: A security service which verifies that stored or transferred information has remained unchanged. WPA, WPA2: Wi-Fi protected access (WPA) is a protocol to secure wireless networks created to patch the previous security protocol WEP. WPA implements part of and WPA2 implements the entire IEEE 802.11i standard. In addition to authentication and encryption, WPA also provides improved payload integrity. Confidentiality: A cryptographic security service which allows only authorized users or network nodes to access information content. Wi-Fi: Wireless local area networking based on IEEE 802.11 standards.